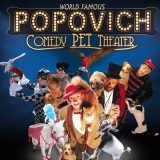 Popovich Comedy Pet Theater is the most beloved family show in the world featuring more than 30 house cats, dogs, parrots… even a miniature horse! All performing pets were rescued from animal shelters and now enjoy life in the limelight with co-star, Gregory Popovich who also incorporates world-class juggling, gymnastics and balancing acts into the 60-minute stage production. Popovich is a fifth-generation Russian circus performer and author who’s toured with the Moscow Circus and Ringling Brothers and Barnum & Bailey Circus. Named “Best Family Show in Las Vegas,” Popovich Comedy Pet Theater has wowed audiences in more than 20 countries including France, Israel, Chile, Mexico, Colombia, Germany, Belgium and Holland.